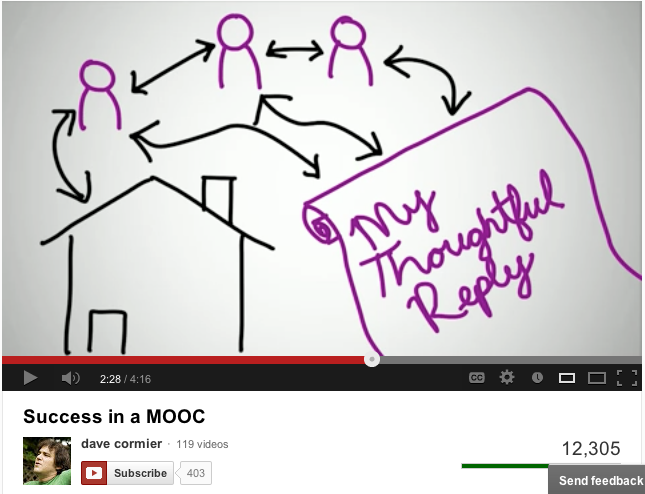 As I watched Dave Cormier’s Success in a MOOC video I found myself making mental notes about how I might translate the learning-as-networking principles back into a f2f classroom. In so many ways I think these principles for online learning get overlooked in bricks-and-mortar classes. Despite all our efforts at engaged and experiential learning it seems to me that we don’t do a good enough job helping students experience networked learning in conventional on-campus environments. For example, Cormier explains that once you’ve begun learning something in an online class the next step is to declare yourself by writing something about what you’ve learned in, say, a posting to your blog; then you deepen your learning by finding and making a connection to someone else’s learning by, e.g., posting a thoughtful reply to their blog. In f2f and hybrid classes many of us try to do this through in-class conversation, short writing assignments, and/or postings outside class to an online discussion board or blog. The actions are analogous but relatively superficial. It’s just homework, in other words. Just an activity. What’s missing is the [social] networking energy–the thing that makes it satisfying and even addictive to repeatedly visit, read, and comment on someone else’s thoughts. That’s the hook I’m wanting to activate, somehow, in all my courses–f2f, hybrid, and wholly online. Also, when we declare ourselves online there’s an underlying assumption that we’re inviting a response–and, increasingly, that we’re not just saying one thing (i.e., one blog posting, one YouTube video) but sharing a body of work and inviting others to consider and respond to some or all of it. So Cormier’s MOOC video is the thing I’m looking at now, but YouTube tells me there are 118 more videos in his library, and I can subscribe to updates and comment on what I’m seeing. But in a f2f class a student composes one text at a time and the rest of us may never see anything else she has created on a kindred topic in the past nor in the future. We may glean some of her insights through class discussion but her body of work is invisible. I’m looking for ways to make all that other significant thinking and making more a part of the person we meet during our f2f semester. Like a multimodal portfolio of thoughts and experiences or a D&D style avatar that summarizes the diverse skills and traits likely to be activated during the course. Something that helps us better appreciate who is in the room (literally or figuratively) and how they have come to think and know what/as they do. This entry was posted in digital remediation, instructional design and tagged MOOC-EDC by Brooke Hessler. Bookmark the permalink. I’d like to get to the point where I could have a productive back channel running in my f2f courses. I honestly don’t know how many students would use it productively but it would be interesting to try. Yes, the only time it feels really authentic is when (no surprise) there’s a compelling purpose for sustained interaction outside of class. Of course “authenticity” is a sticky wicket. I’m actually OK with the “fake it til ya make it” principle–i.e., asking them to practice the kinds of online/back channel interaction that can lead to deeper learning with the understanding that the process benefits from practice and sometimes things really can click intellectually and personally despite the fact that the process began as more of an academic performance.